AMC is proud of the relationship we have with VCU to offer development and marketing internships that help develop students for the real world. 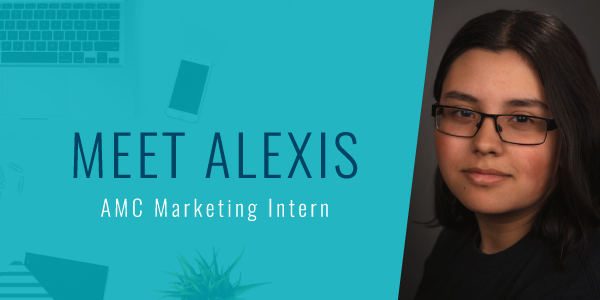 This spring we were fortunate to have Alexis as a marketing intern and are sad to see her time with AMC coming to a close. We spent some time catching up with her to find out her perspective on her marketing internship in this fun Q and A. My name is Alexis DeJesus, I’m a Graphic Design major at VCU, and plan to graduate in 2021. I participate in a lot of art groups and end up spending most of my time either drawing or playing semi-competitive Overwatch with my team. What was a normal day like as a marketing intern at AMC? I would get in at the beginning of my day and start by seeing what assignments I had. Exactly what I did evolved a bit over the course of the internship as new projects came up. At the beginning I was working a lot on the site layout and making individual graphics, and by the end of the internship I was doing more social media posts/graphics and editing documents. I’d take a lunch break about midway through my day, and then get back to work, with the occasional meeting that I could sit in on. What were your favorite parts of your internship at AMC? My favorite part of the internship was probably all the different types of projects I got to work on. From the website to socials to even getting to work on redesigning the stationary, I got to do a lot of things that I hadn’t before and try new things. How do you think your internship may help you with other internships or jobs? This internship was a great experience in working in a local and modern company, and I feel more confident about what I can expect working in similar jobs. I also created a lot of collateral and graphics that I can put in my portfolio and be proud to have been a part of. What are you most looking forward to about your in your junior year? I get to pick my courses starting junior year, so I’m the most excited about my elective classes in web design and studio management. I’ve gotten a lot more comfortable with WordPress and general website design during my time at AMC and look forward to continuing it. What advice do you have for other students who are starting new marketing internships? Don’t be afraid to ask questions, and definitely don’t be afraid to experiment with new things! You can learn a lot from seeing other professionals’ work and processes. Being an intern is as much of a learning experience as it is a work one, and you get out what you put into it. Take the time to build skills that you’ll be using later!